The production of Henry VI will play at the Dog Story Theater in Grand Rapids, June 15-24, 2018. June 15, 16, 22, and 23 at 8:00 p.m.
June 17 and 24 at 3:00 p.m.
June 30 at 7:30 p.m.
July 1 at 2:00 p.m.
Over the past three seasons, the Pigeon Creek Shakespeare Company has been making its way through Shakespeare’s history plays. Since 2015, the company has performed Richard II, a conflation of the two parts of Henry IV, and Henry V. Now the company is tackling Henry VI, Shakespeare’s epic story of the Wars of the Roses, which the playwright wrote in three full-length plays. 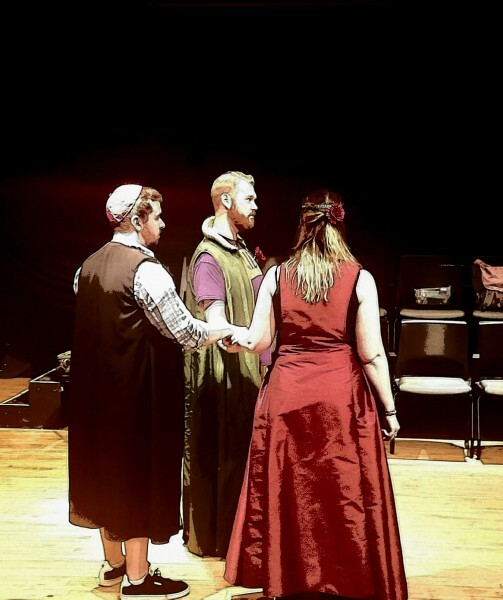 Director David Little and company executive director Katherine Mayberry, who serves as dramaturge for this production, have created a script that combines sections of all three parts of Henry VI into a single production. The production will also include original music, performed by a Balladeer character who helps to guide the audience through the story. Musical composition is by actor Scott Lange, who also plays the Balladeer. Pigeon Creek’s cast features actors Riley VanEss as Henry VI, a king who tries to hold his country together as rival factions threaten civil war; and Kathlen Bode as Queen Margaret, Henry’s wife who proves to be a bolder and more ruthless leader than her husband. The cast also includes actors Charles Decker, Michael Dodge, Kat Hermes, Samantha Hill, Amber Miller, Kate Tubbs, Steven Schwall, Isaac Wilson, and Scott Wright. Fights are choreographed by Michael Empson. The production of Henry VI will play at the Dog Story Theater in Grand Rapids, June 15-24; Jenison Center for the Arts, June 30; and Seven Steps Up in Spring Lake, July 1. Ticket information for all venues is listed below. Ticket prices range from $7-$16. The production will also later be remounted as part of the Grand Valley Shakespeare Festival during the fall of 2018.